For many dental professionals, products that retract the cheek play a crucial role in successful procedures. There are a variety of factors that make up a good cheek retractor, including absorption, increasing workable space, and patient comfort. At Richmond Dental & Medical, we definitely have some award-winning products that are used for procedures that require cheek retraction. We’ll get to those soon enough, but first let’s define cheek retraction, then discuss when these types of products are used. What is a cheek retractor? Typically, a cheek retractor serves two purposes: it pulls tissue away to expose an area that needs dental work, and it keeps the tissue in a retracted position during the procedure. In the past, dental assistants have worked as manual retractors for dentists, but today most professionals rely on products so that they have plenty of space to work unencumbered. When are cheek retractors used? While cheek retractors can be used for restorative procedures on bicuspids and molars, they are also employed for standard procedures like fillings, crown preps (during the prep and while cementing the temporary crown), crown cementation, and sealants. When using sealants, keeping the tooth dry is of utmost importance. Are there different types of retractors? There are many different types of retractors. There are mouth props—also known as bite blocks—which are made from rubber and used for patients who have trouble keeping their mouths open. Dental mirrors can also be used as retractors, and there are also specific retractors for the cheek, tongue, and lip, depending on what’s needed for a specific course of action. What kinds of cheek retractors does Richmond Dental & Medical offer? 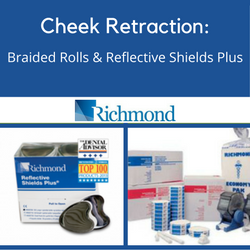 At Richmond Dental & Medical, we manufacture two award-winning products that can serve as cheek retractors: our Reflective Shields Plus® and our Braided Cotton Rolls. Since a soaked cotton roll or cheek pad will often start to slip, it can gag a patient. Both of these products stay in place during procedures, and are easily removed when appropriate. How is the Reflective Shields Plus® product used for retraction? As we’ve noted before, Richmond’s Reflective Shield Plus® has received high marks with dental professionals. While the product retracts the cheek, its mirrored side also reflects light into the back of the mouth, making it easier for dental professionals to see the areas they’re working on. The Reflective Shields Plus® durable nonwoven material absorbs fluid and retains moisture without compromising the work space. Keeping the tooth dry is essential when using most cements or sealants. Since the product’s special heart shape easily accommodates buccal curvatures and keeps the shield in check with the parotid gland, it’s also comfortable for the patient since it does not pinch like cardboard. How are Braided Cotton Rolls used for retraction? Our Braided Cotton Rolls, which are made from purified, medical-grade cotton, can be used for a variety of procedures. Longer lengths are perfect for bleaching, or for anterior restorations such as fillings, crowns, veneers, and bonding. The product’s unique design provides a secure fit into the buccal curvature and the sublingual space, all while offering high absorption to help maintain a dry field. Though dryness is paramount, high absorption is key, too: which means dentists or hygienists aren’t switching out soaked rolls as often. Since our Braided Cotton Rolls don’t stick to the mucosa, they are comfortable for the patient. What cheek retractors do you use? As this article suggests, there are many ways to retract the cheek, whether it’s one of Richmond’s products, a completely different type of retractor, or an entirely unique method. We’d love to hear any success stories you’ve had with one of our products, or learn more about the techniques you’re using. If you would like to learn more about our products, please contact us anytime.